Cotton is past third week of bloom in many fields, and I have been noticing leaf spots. Some leaf spots we will see but not cause a major issue and we do not have to spray. I’m seeing stemphyllium in most fields. Some fields are worse were we have lost potassium. In this field, it was previously in pine trees and fertility is low. The underlying cause of this disease is result of deficiency in potassium in the plant. The spots have an ashy-gray centers with a dark purple margin. Sometimes the spots detatch from the leaf giving a “shot hole” appearance. 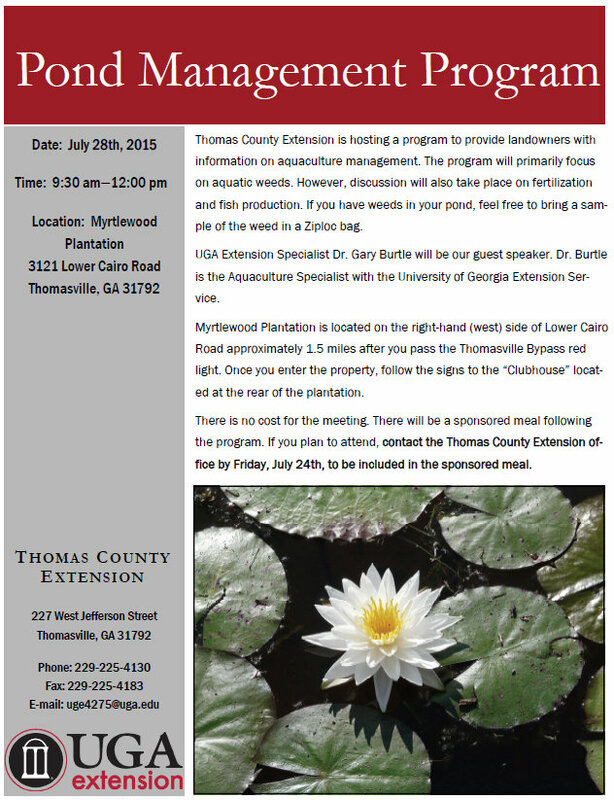 UGA recommends put out all potassium preplant on Piedmont, Coastal Plain, and Deep Sand soils. Split applications of K have not proven to be effective on Tifton type soils. However, foliar K has shown yield difference. UGA Extension Fertility Scientist Dr. Glen Harris says “foliar K applications should automatically be considered on deep sands, low K soils, high Mg soils, high-yield conditions, short season varieties and especially, where severe K deficiencies and leafspots have been observed.” Because this disease is associated with nutrient deficiencies, fungicides are not considered to effective control. This is angular leaf spot I observed today, which is a bacterial pathogen (Xanthomonas). The lesions or spots on these leaves are more defined by the veins on the leaf, creating an “aungular’ appearance. UGA Extension Pathologist Dr. Kemerait says As the lesion develops, it can take on an appearance more like target spot but is typically differentiated from target spot because of a yellow halo around the spot and because the initial water-soaked lesion is still discernible in the larger lesion. We have not seen a major outbreak in many years but are seeing it more frequently this year. It is most common after periods of rainfall. Since this is a bacterial pathogen, the use of fungicides is not considered effective control. We may see these spots show up low in the canopy as cotton becomes more rank in growth. I have not seen any yet, but has been reported in Mitchell County. 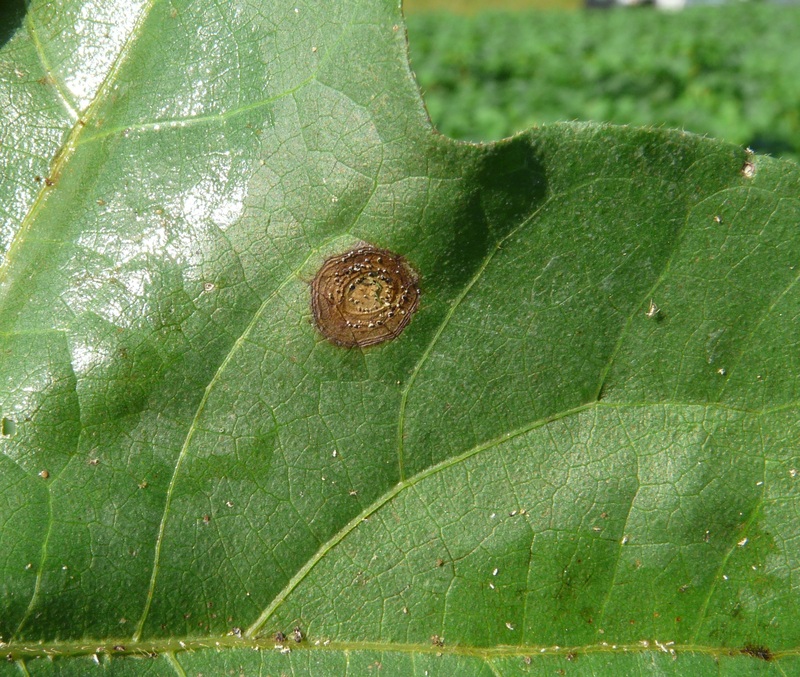 Target spot (Corynespora) is easily identified by the marble-size spots on a leaf that demonstrate a patter of concentric rings. Infection and defoliation typically begin on the lower part of the plant and move up. 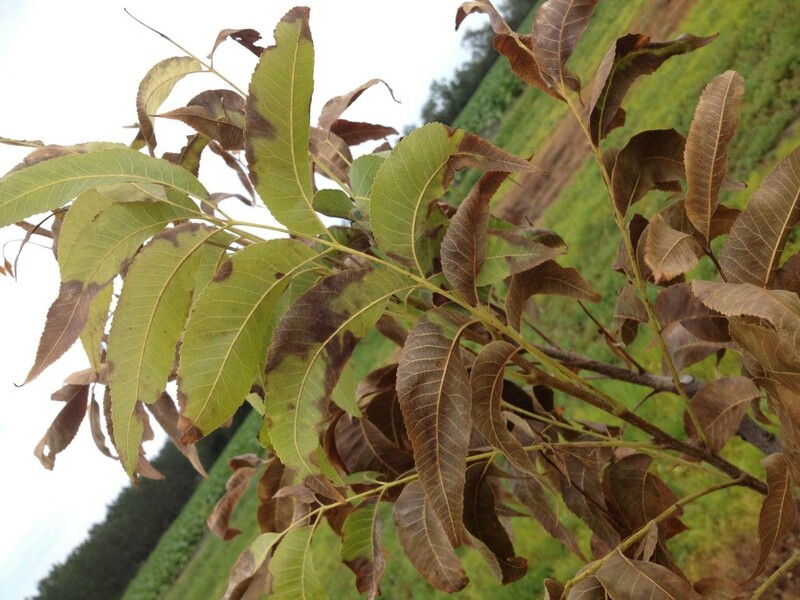 We can see significant defoliation with lesions found on boll bracts or bolls themselves. Fungicides have been shown to aide in the management of this disease. Timing of the first spray will vary based upon weather conditions during a season. Current recommendations for initiating a fungicide application for target spot is when the crop is between 1 and 3 weeks of bloom. Depending on conditions (wetter or dryer), the optimum time can change. Growers should begin to assess the need for a second application of a fungicide no earlier than 3 weeks after the first. 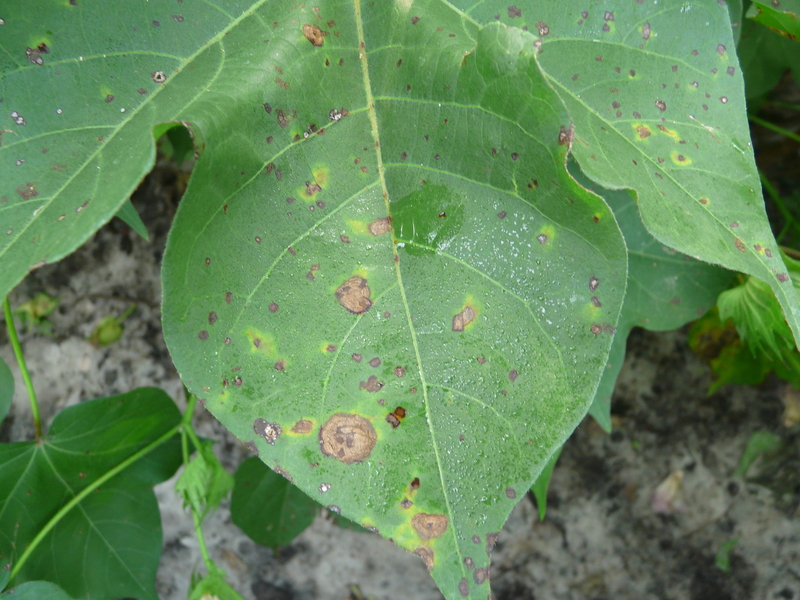 it is currently unclear if some varieties of cotton are more susceptible to target spot than are other varieties; however work contunes to answer this question. 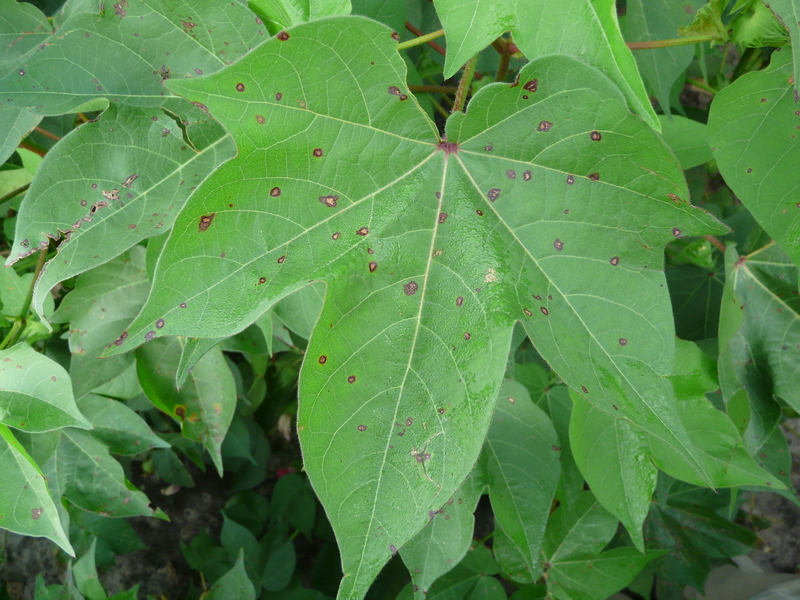 Regardless of variety, the severity of target spot can be minimized by managing cotton growth with PGRs to eliminate rank growth. Last week, I was called to look at the first fish kill this season. This is a small 1/2 acre pond surrounded by trees. It is spring fed and no agriculture around. Different species of bass and bream were found dead the next morning. 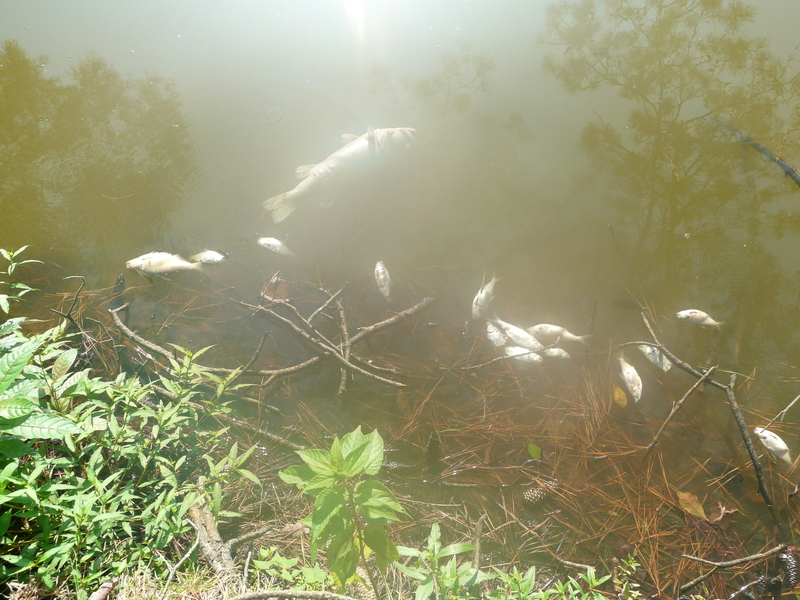 The fish kill happened overnight and is a result of low oxygen levels in the water. We know this is the case when larger fish die first, and lack of oxygen would affect larger fish before small fish. When temperatures are this high and we see cloudy days/nights, the lack of oxygen in the water from photosynthesis causes these kills. “The usual reason for fish death after rains is a partial oxygen depletion caused by the influx of water which has no algae in it or a high concentration of bacteria in it. 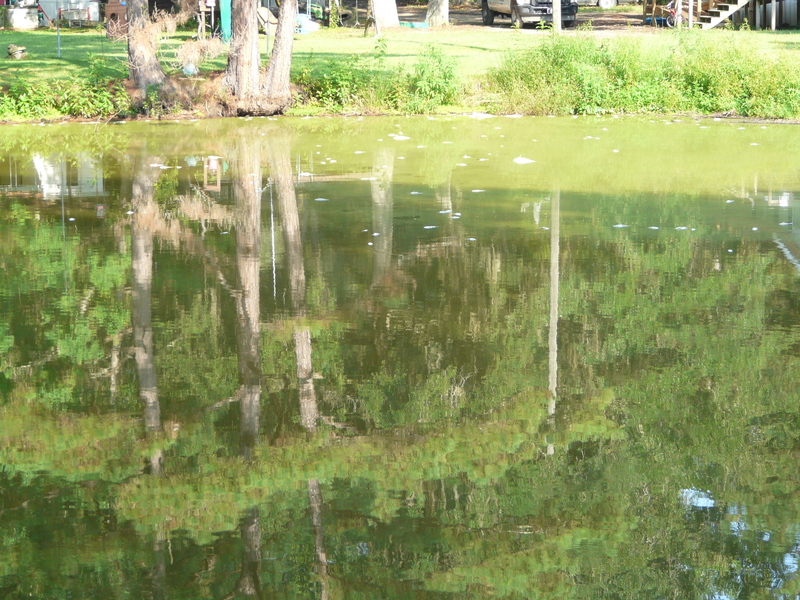 When algae are replaced by bacteria, the water turns brown in color and oxygen concentration drops. Bass are larger than bream, so may be affected first. The oxygen stress may cause the fish to become susceptible to disease, so fish deaths may occur for several days after the partial oxygen depletion. The last few years, I have had calls related to the leaves of young pecan trees scorching and often dropping from the tree in mid-summer. We’ve investigated this from a number of angles and while a host of factors can contribute to the problem (nutritional imbalance, cold damage, etc. ), it appears to me that what we are seeing is primarily an environmentally related problem affecting tree establishment. Many times when the leaves of a tree scorch in mid-summer, its an indication that there is a problem with the root system or vascular system of the plant. When trees are transplanted in to the orchard from the nursery they will inevitably go through a period of “transplant shock”. If everything is done correctly and growing conditions are suitable, the trees recover from this within the first month or two following budbreak as the roots grow and the tree gets its root foundation established. At this point, the tree begins developing vigorous shoot growth if all is well. 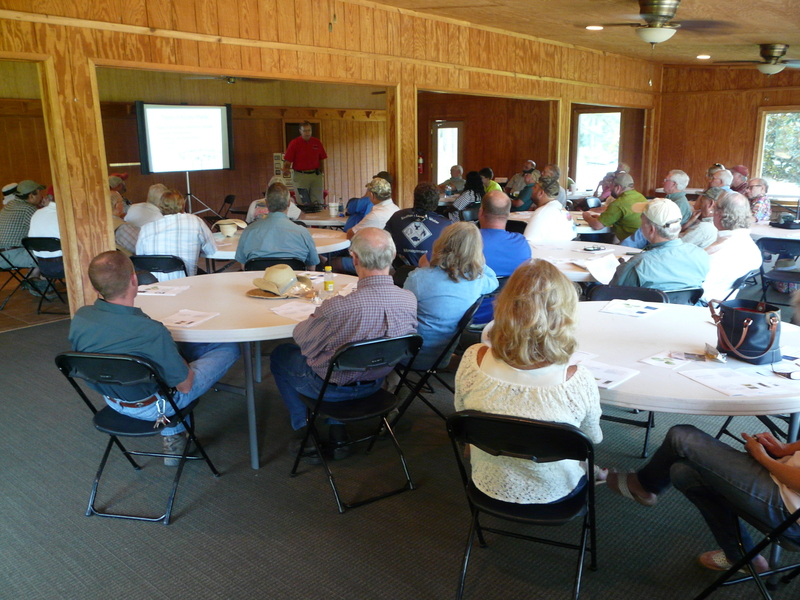 I’ve talked and written a lot about the need for irrigation on young pecan trees. But, there is a love/hate relationship with pecan trees and water. 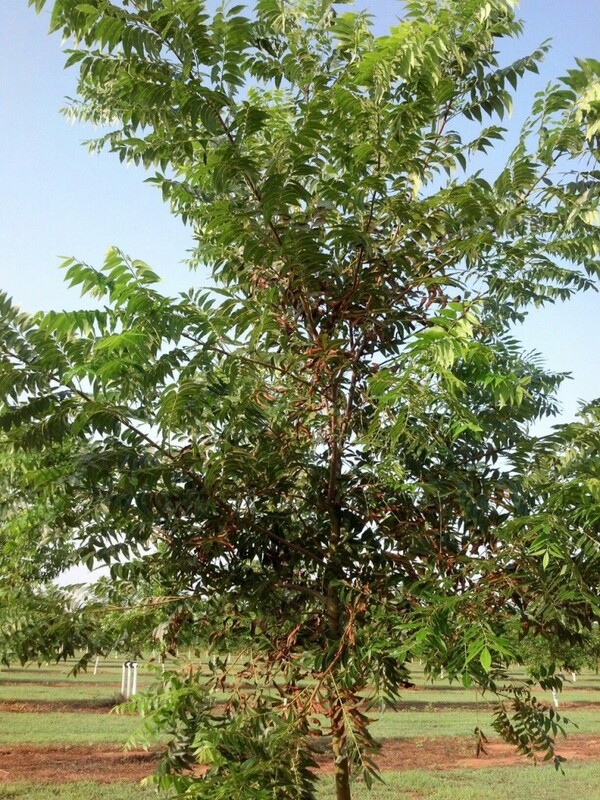 Soil moisture is the key to making young pecan trees grow but this must be in combination with well-drained soil. Pecan trees like water but they don’t like to be water-logged. This is why they do not survive well when planted in low-lying, poorly drained soils. The tree’s roots can’t receive enough oxygen and they essentially drown, causing the roots to die-back. Even in a well drained soil, after periods of heavy rainfall when the soil may stay wet for an extended period, you can get a little root die-back. As the soil dries out, new roots grow and replace those that were lost. This is a normal process and is usually not a big deal for a tree that is already established. The root system is large enough to compensate for the losses. But, for a tree still trying to get its roots established, this situation can cause problems because the root system is already very limited. In my research, I do a lot of measurement of tree water stress. First year trees are usually much more water-stressed than more established trees, even under the best management as a result of their limited root system. The nutritional status of the trees coming out of the nurseries is usually excellent and this is what most trees’ growth feeds off of for their first year following transplant (even though many growers apply a lot of fertilizer in the first year). As a result, these young trees often attempt to push out with vigorous shoots. The harder a young tree is pushed for growth with nitrogen, the greater potential for problems in this situation. When the limited root system cannot keep up with the growth that tree is trying to make, issues can arise. The last three years, we had wet weather in the spring. 2012 was an exceptionally dry spring with about a 2″ deficit in rainfall for April. However, from 2013-2015, we had April rainfall amounts from 1″ to over 5″ above the average. In addition, 2013 remained wet season-long. Following April, the weather conditions were hot and dry in 2014 and 2015. When the limited root system of young trees gets water-logged and many of the remaining roots suffer or die from lack of oxygen, the tree must re-grow these roots to support the growth of foliage. As the weather turns hot and dry immediately following such a period of heavy rainfall, the tree does not have enough time to develop a new root system adequate to meet the increased water demand under these conditions. When this occurs, the tree responds by shutting down and sacrificing some of its foliage in order for the tree to have the resources it needs to survive. This leads to the scorching and in some cases, dropping of leaves. While nutritional problems like N:P or N:K imbalance can also lead to scorching, most of the time when we compared leaf tissue analysis, there is no difference. I have compared water stress on scorched vs. healthy trees as well, and in most cases the scorched trees are extremely water stressed compared to healthy trees – even though they are under adequate irrigation. In such a case, the root system is simply not capable of transporting that water to the tree as it needs to because the root system is still too limited. Cold injury that damages the tree’s vascular system causes a similar response (and we have certainly had some of that as well over the last few years). But, if cold damage is not apparent, the problem is that the tree has not yet established enough root system to support its growth. The problem may be more likely to show up on sandy or heavy clay soils or those with poor fertility, such as that found on sites planted in pine trees immediately prior to pecan planting. The good news is that these trees will usually grow out of this scorching problem as more suitable growing conditions arise. It may take them 4 or 5 years to reach that point but they do seem to grow out of it with no long term damage. 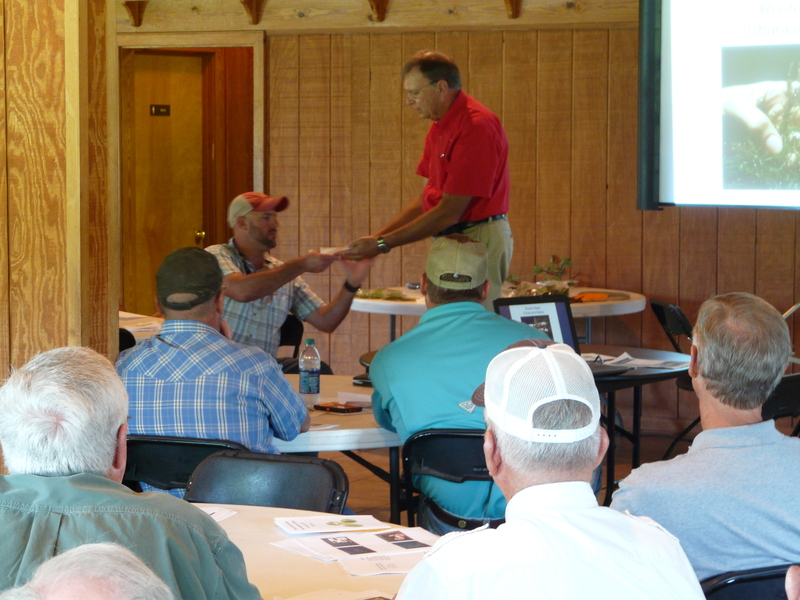 Here is some information UGA Extension Peanut Agronomist Dr. Scott Monfort put together on runner-type varieties grown in Georgia and Peanut FARM. The USDA Crop Acres Report is estimating Georgia producers have planted 800,000 acres of peanut. This is more than expected. With an expanded planting window, this will help growers manage the increased acreage at harvest but trying to keep track of maturity of these acres may prove to be daunting. One way growers can help track the maturity is through the UFL PeanutFarm Website. Based on research, 2500 aGDDs is near maturity for most medium maturing varieties. We want to start doing maturity checks in the 2350 to 2400 range. FloRunTM ‘107’: This is a medium- maturing peanut (135 to 140 days). Georgia-06G: Georgia-06G is a medium maturing peanut (135 to 140 days). Georgia-09B: Georgia 09-B is a medium maturing peanut (135 to 140 days). Georgia-12Y: This is a medium-to-late maturing peanut (140 days +) — May not follow board perfectly. Georgia-13M: This is a medium-to-late maturing peanut (140 days +) — May not follow board perfectly. Tifguard: Tifguard is a medium maturing peanut (135 to 140 days). PeanutFARM is a group of tools aimed at helping growers manage peanut development and maturity by tracking adjusted growing degree days (aGDD). aGDD’s use upper and lower daily air temperatures, plus the amount of water the crop receives from rainfall and irrigation, to predict the development of the crop. In addition to tracking maturity, aGDD’s are used by PeanutFARM to help schedule irrigation through estimating crop canopy cover and daily water use. This daily water use is then modified using weather data – which can be automatically drawn from state networks or input for individual fields, depending on grower preference. As the grower develops their own profile, each field can be managed separately and processed by PeanutFARM to accurately predict the need for irrigation and optimum harvest time. The purpose of PeanutFARM is to provide the producer with tools to ease both in-season and harvest management decisions. Below are the three fields I have registered in the PeanutFarm program. 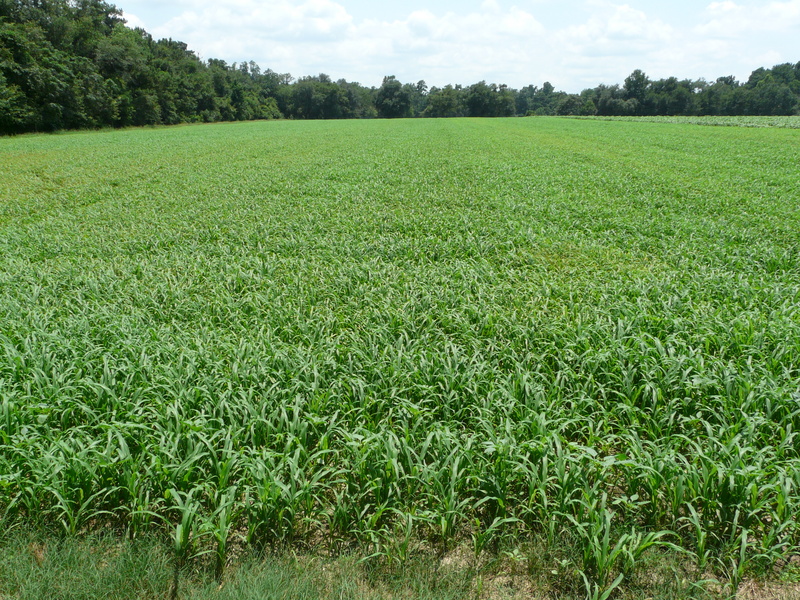 Here is a field of Leafy 22 Pearl millet used for grazing. Pearl millet is also used for hay and silage. We need to have 20 – 24 inches in height before cows start grazing. However, leaf spots showed up this past week. 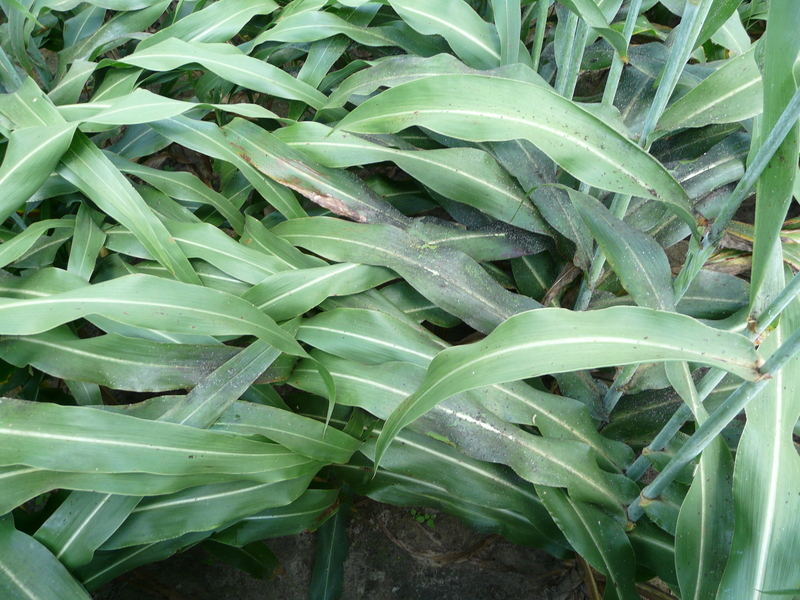 The spots are more pronounced in certain areas of the field, but mostly all leaves are covered in spots. 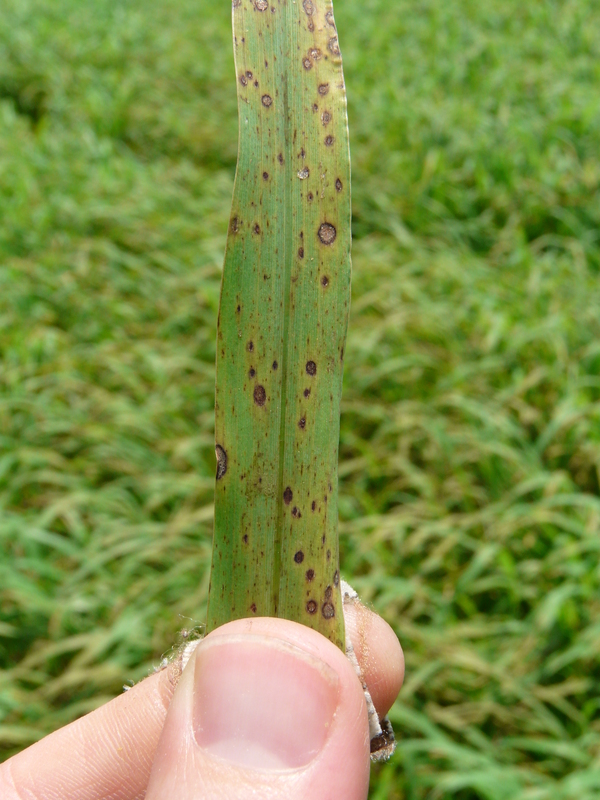 The spots turned out to be Pyricularia Leaf Spot or Gray Leaf Spot. This is caused by the fungus Pyricularia grisea. 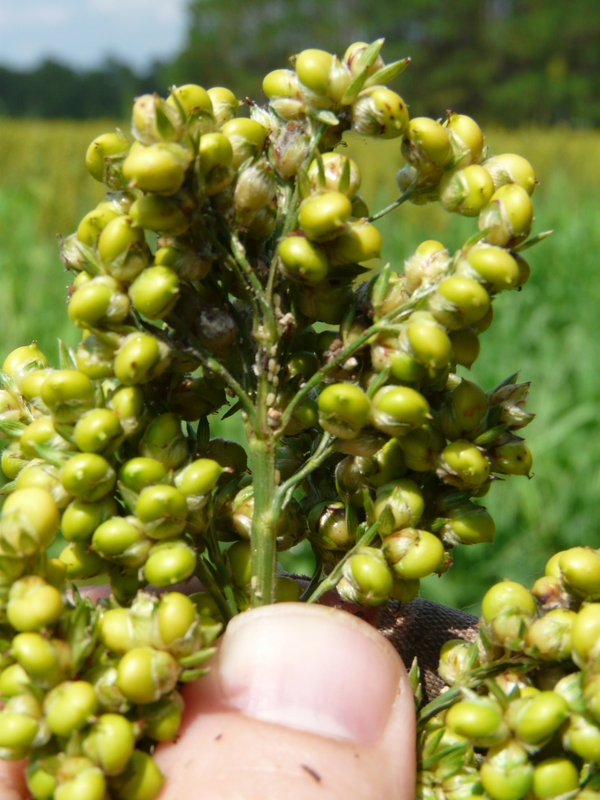 This is a very common and important disease of Pearl millet. I have seen Pyricularia before on Pearl millet. UGA Extension Grain Pathologist Dr. Alfredo Martinez says newer dwarf varieties may have some resistance to Pyricularia. 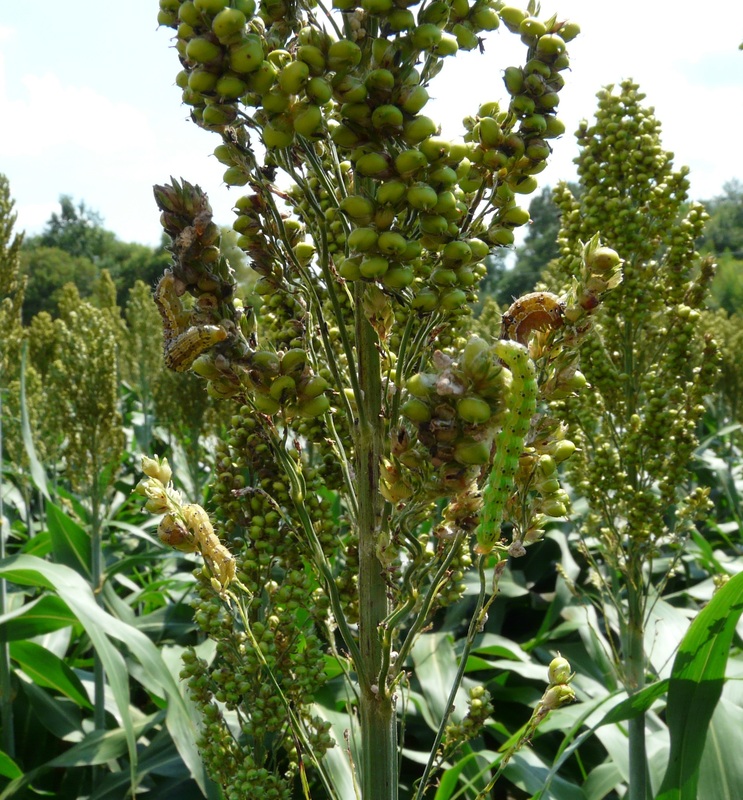 Usually fungicide applications are not recommended for pearl millet. Below is some more information on Pearl millet. 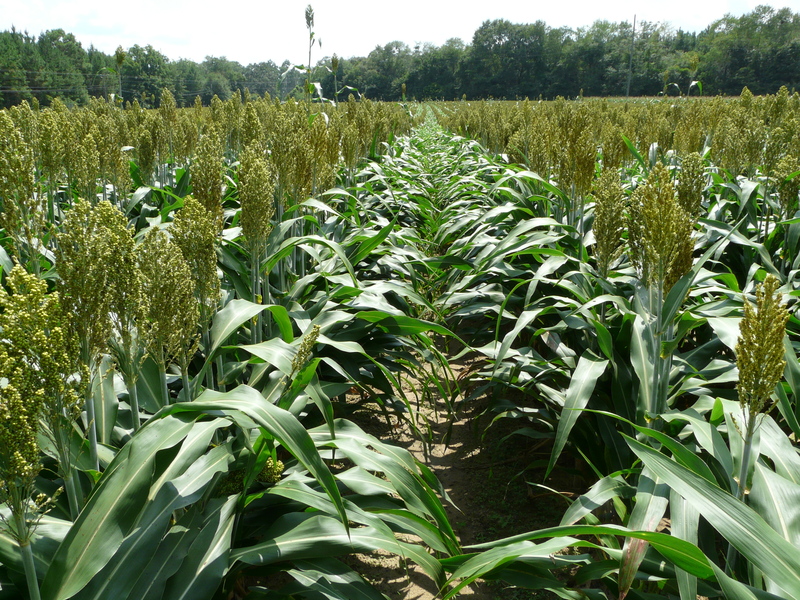 Our early planted sorghum is heading now and is past flowering stage. We are looking at a few different insect pest I want to write about. Some fields have sprayed 3 times now for sugarcane aphids. At this point, we want to watch for aphids in the grain heads. Also we are seeing caterpillars in grain heads. Last week, we were checking for midge. Midge can be more difficult to scout for. Once grain heads come out, we need to be looking for midge. Once flowering is complete, midge is not an issue. One way to scout is take a paper plate, and slap the head in the plate. 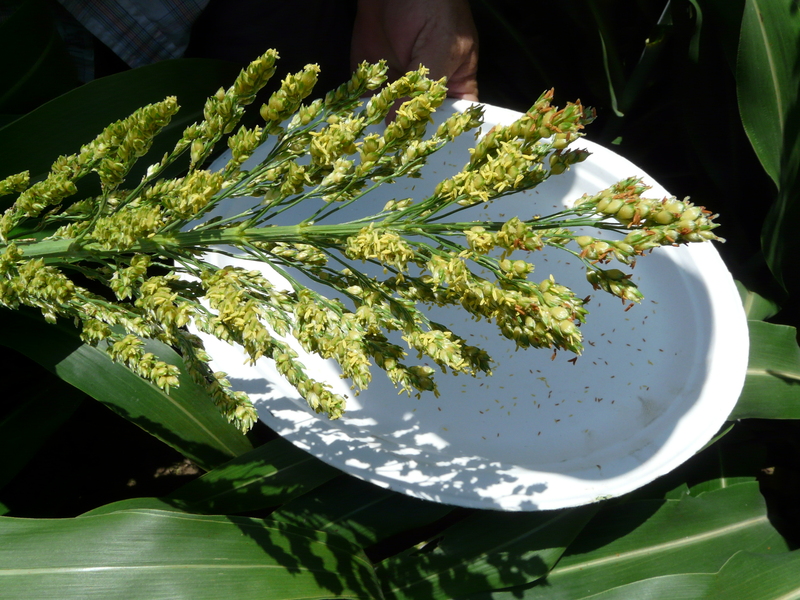 Dr. Angus Catchot, entomologist in Mississippi, shows on Scouting For Sorghum Midge With Confidence, a method of putting a gollon ziplock bag over the grain head and thumping it. The midges fly to the top of the bad, and you don’t have to close the bag. UGA Extension Entomologist Dr. David Buntin says we need to avoid pyrethroids and insecticides that would flare aphid populations. Do not do automatic sprays for this reason. We are also seeing caterpillars on the grain heads. Most of the caterpillars we are seeing are corn earworms. We were also seeing armyworms. Our threshold is to treat when an average of 1 or more (1/2 inch or larger) of any of these worms are found per grain head. Below is a photo of corn earworms on this head. Flowering is complete here, and they blend in to the grain. One of the four fields we checked yesterday is at dough stage of development. Dr. Buntin says when we get to dough stage, we do not have the concern for sugarcane aphids. We still need to check for aphids in the grain heads, because of issues with harvest equipment from aphid honeydew. 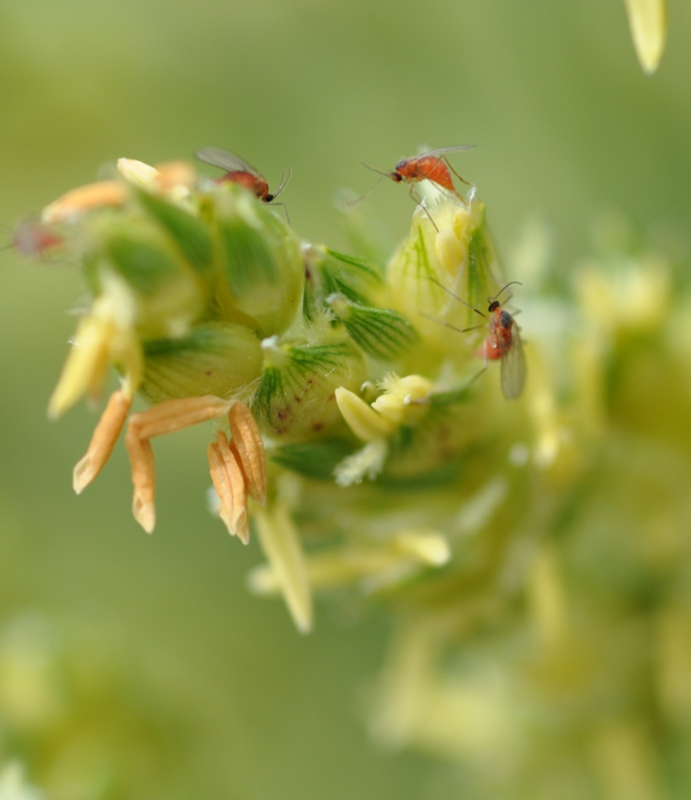 Here is a photo of some aphids in the grain head. This field is in the dough stage and past flowering, so pre harvest intervals are more difficult as we move to heading. Some milo fields have been sprayed three times for sugarcane aphids. It is difficult to assess thresholds following a devastating 2014 season where aphids hurt us before we knew what was going on. However, Dr. Buntin believes we should be able to get SCA with two sprays during the season. We have learned to scout by not only checking aphids on a plant, but walking fields and looking for honeydew. It is easier to see honeydew on the leaves from a distance and you can check more than one row at a time. Where honeydew exists, this indicates a high aphid population – one that is treatable. Below is a photo of sooty mold on leaves. Sooty mold grows on the honeydew left from aphids. This is another indicator, however, I have not seen sooty mold show up until now. This is not an issue for the plants, just sign of aphids.